In this video, Jennifer Bridges, PMP, shows you how to write a scope of work for project management. Follow her steps to get started or use our project plan and scope document template! 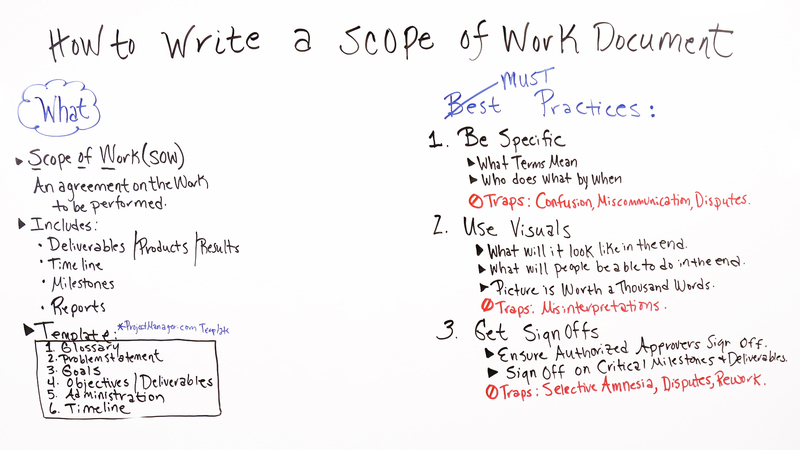 A scope of work (SOW) document is an agreement on the work you’re going to perform on the project, Jennifer said. Deliverables: This is what your project delivers, of course. Whether it’s a product or a service, it’s the reason you’re executing the project for your customer, stakeholder or sponsor. Whatever that deliverable is, and it can be some sort of document or report, software, product, build (or all of the above), you need to have each item clearly identified here. Timeline: Think of a timeline as a road leading from the start of a project to its end. It’s a section of the document that delineates the major phases across the schedule of the project’s duration. It should also mark the points in the project when your deliverables are ready. As you can guess, it’s essential to scoping out the overall plan of any project. This is best presented visually, like a rolled-up Gantt chart plan, so the stakeholders can see the high level timeline. Milestones: Projects can be very long and complex, which is why they’re laid out over a timeline and broken down into more manageable parts called tasks. Larger phases of the project are marked by what is called a milestone. It’s a way to help you monitor the progress of the project to make sure it’s adhering to your planned schedule. Define your key milestones in the Scope of Work document, including project kickoffs, meetings, hand offs, etc. Reports: You’ll be generating these throughout the project, delivered to either you team or customer, stakeholder or sponsor. They’re a formal record of the progress of your project, but they’re also a means of communication beyond whether the project’s on schedule or not. Depending on how you customize them, there’s a wealth of data that can serve a number of different audiences. Define how you’ll be reporting on the project and when the stakeholders can be expecting them and from whom. But before you get to writing, you need to make sure you follow Jennifer’s advice. It’s not that difficult, but it needs to be thorough, because you don’t want to have to play catch-up with paperwork when you’re in the heat of the project. Pro-Tip: The SOW is essential to the project plan, and is often included as part of the overall project plan, but it can be time consuming to write. Remember to use our free scope and project planning template to help save you time. The link is at the top of the page! Today, we’re talking about how to write a Scope of Work document and with that, I want to talk about some best practices. But before we start, I want to clarify what the Scope of Work document is. Some people you may hear it referenced as the SOW. Basically, it’s an agreement on the work to be performed on the project. It includes what deliverables are produced or maybe even products or any results. It also includes the timeline for this project as well as important and critical milestones and different types of reports that are needed and specifically who those reports go to. I recommend using a template and most templates include these things: the glossary, a glossary of terms defining what the terms are that will be referenced in this SOW. Also, the problem statement, a little bit more detail about the problem and what we’re trying to solve. It also includes the goals, and it includes the objectives and deliverables that we’ll be producing. It also includes any kind of administration information about the project as well as the timeline. So some people reference best practices and in this case, I call these the “must” practices. So number one, be specific. You wanna be specific when you’re clarifying or defining terms so that everyone has a clear understanding and common understanding of what the terms are. You also wanna be specific when you’re defining who does what and by when. You want to… By doing this, you’re avoiding some of the traps which could be confusion, like who’s doing what and when, or what things mean, or miscommunications which ultimately can lead to some disputes. You also want to include visuals, wanna paint the picture of what it will look like in the end once this Scope of Work, or this project, is implemented. You also wanna be able to show what people will be able to do at the end of this project by implementing this. Remember, a picture is worth a thousand words. Again, you’re avoiding a trap here which has to do with misinterpretations, so the visuals help avoid that. And the third one is getting sign-offs. You wanna ensure that the authorized approvers sign off on your scope of work document. You also want to have them sign off at critical milestones and deliverables, again, avoiding these traps. If you’ve ever felt like people on your team or your project get selective amnesia, well we wanna avoid that. You also want to avoid disputes and any costly rework. So if you need a tool that can help you manage and track your Scope of Work document, then sign up for our software now at ProjectManager.com.